“A Single Breath.” Ludwig van BEETHOVEN: Piano Sonata No. 30 in E Major, Op. 109 (1820); Piano Sonata No. 31 in A-flat major, Op. 110 (1821); Piano Sonata No. 32 in C minor, Op. 111 (1822). Beth Levin (pno). Navona Records NV5908 (1 CD) (http://www.navonarecords.com/). “The sonatas, written in 1820, 1821, and 1822 respectively, were conceived together as a unit and so might be regarded as one, especially when heard together.” So writes Emily Howard in her program notes accompanying this release. 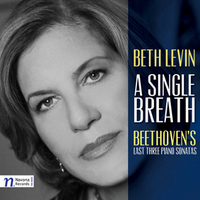 Indeed, the title of this recording – “A Single Breath” – is drawn from Beethoven’s own description of how these sonatas were conceived. Accepting Beethoven’s view, Beth Levin takes us on a journey through a vast, emotional landscape in seven movements. From the limpid, lovely broken chords that open No. 30 in E Major to the ethereal trills that dissolve in the closing pages of No. 32 in C Minor, this performance – recorded in concert at Faust Harrison Pianos in New York City – should be heard in total. The end of Op. 109 eases into the gentle opening of Op. 110; the chords that bring Op. 110 to a close are allowed to resonate in the mind before Op. 111 announces its presence. There are no “studio retakes,” not that any are needed, and the 1887 Steinway Ms. Levin plays produces rich, deep bass notes and bell-bright treble; the mid-range is wonderfully present, blending seamlessly into top and bottom. This is one of the best piano recordings I have heard. The dynamic range is extremely wide, and yet one can hear every note – from faintly whispered trills to thunderous chords – without any need to adjust the volume during playback. The engineers have done well by her. Ms. Levin’s recording joins an impressive list – Mitsuko Uchida, Alfred Brendel, Maurizio Pollini, and John O’Connor, among others – who offer the last three sonatas on a single disc. Suffice it to say her account is at home in very good company.